The Goliath stick insect is huge and colorful! Both sexes of the Goliath stick insect are apple green with hints of gold, purple, red and yellow. Colorful patterns on the underside of the wings of Goliaths are used as a defensive tactic in order to ward off predators. While the Goliath stick insect is truly massive reaching lengths of 25 cm (10”), it is the second largest stick insect (after theTitan stick insect) in Australia, and though not as long, the Goliath insect has a heavier, sturdier build. The Goliath stick insect is docile and will take to being handled gently. They make a great, exotic pet that is easy to care for eating only leaves of English Ivy, Oak, Eucalyptus, or Berries (brambles), to name just a few. We offer these amazing creatures as Ova, Nymphs, and or Mounted dried specimens. We had flown into St. Lucia, an island in the Caribbean Sea, and were waiting for our “Bare-boat” captain to show. We were nursing our beers under the lovely canopy of a huge banyan tree when all of a sudden, a rain of small black-brown colored “Seeds” rained down upon us. We all looked at each other, completely surprised, (and possibly grossed out)! We all had enjoyed our first baptism by stick insect! We looked into the tree more closely and found several Diapherodes Gigantea releasing their eggs. 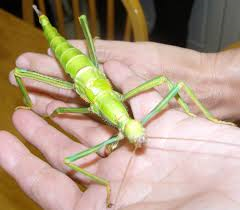 It is said half jokingly that the Giant Lime-Green Stick Insect is the largest indigenous animal! It is huge! Females, which can be over a foot long, are a brilliant shade of apple green. They have short, stubby yellow spines and serrated legs. They have a large chute at the end of the abdomen for flicking eggs and also have small rudimentary wings which are useless for flight. Males are a little less brightly colored, being a light chocolate brown with wings a reddish-brown, but are still incredible looking! These beautiful creatures are docile, easily handled, and make great pets! They eat many kinds of plants including but not limited to: Berry, Eucalyptus, Oak, Hawthorne, English Ivy, and Privet. We currently have several nymphs and also offer Ova and mounted specimens at various times so please inquire as to which you are interested in. The Goliath stick insect is huge and colorful! Both sexes of the Goliath stick insect are apple green with hints of gold, purple, red and yellow. Colorful patterns on the underside of the wings of Goliaths are used as a defensive tactic in order to ward off predators. While the Goliath stick insect is truly massive reaching lengths of 25 cm (10”), it is the second largest stick insect (after the Titan stick insect) in Australia, and though not as long, the Goliath insect has a heavier, sturdier build. 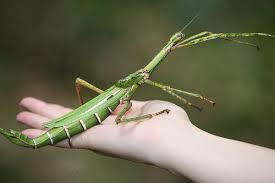 The Goliath stick insect is docile and will take to being handled gently. They make a great, exotic pet that is easy to care for eating only leaves of English Ivy, Oak, Eucalyptus, or Berries (brambles), to name just a few. We offer these amazing creatures as Ova, Nymphs, and or Mounted dried specimens.